Your mouth is full of bacteria. Any opening in the tissue carries the risk of infection. The germs from your tongue and mouth can easily get into your bloodstream. 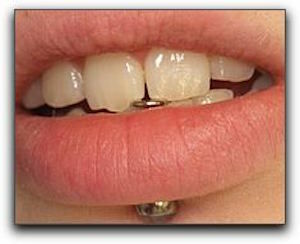 Missoula dentists and doctors are continually treating acute infections caused by oral piercings. Oral infections can be a real problem, and should be a major consideration before getting an oral piercing. It should come as no surprise that having a piece of metal bang around in your mouth can easily damage tooth enamel. Though tooth enamel is amazingly strong, once it’s chipped or cracked, it can only be restored with artificial material. Fortunately, Felton Dental Care – Dr. Brett R. Felton, DMD in Missoula offers many tooth restoration options such as crowns and fillings, but our advice is to avoid the problem if you can. The blood vessels in the tongue are often damaged when the tongue is pierced, causing prolonged bleeding and possible build-up of scar tissue. In some severe cases, the tongue swells up enough to block the airway. A number of periodontal disease studies have shown that wearing oral jewelry is linked to periodontal disease which can bring about tooth loss. Periodontal disease can cause gum recession which exposes the root of your teeth, potentially causing hypersensitivity and pain. Again, our advice is to avoid the trouble right from the start. These are just a few of the dangers or oral piercings. Brett Felton at Felton Dental Care – Dr. Brett R. Felton, DMD can give you more critical information about the risks of oral piercings. If you already have degeneration, call 406-728-0896 to schedule a consultation. How Do Veneers Create Stunning Smiles?